Indians are among the most prejudiced people on the planet, and nothing illustrates this more than the treatment meted out to Sonia Gandhi, one of our most prominent and illustrious citizens. Despite having lived in India for 49 years and having married an Indian citizen, having raised her family in India, and having contributed to the growth of this nation by having led the ruling party of this country for ten years, she is constantly maligned - only because of her foreign race and origin. Yesterday I came across a comment by yet another Indian who referred to Sonia Gandhi as a white Italian, and said that Congress has a tendency to worship white skin - asking whether they would have made her Party President had she been a black-skinned Nigerian by birth. This same comment had been made by a Union Minister in the Modi government, Mr. Giriraj Singh, in April 2015. Indians, in general, are arguably the most racist and prejudiced people in the world, even though we like to scream "racism" at the drop of a hat when we go and live in much more liberal places like the USA. We discriminate on the basis of colour, caste, religion, language, diet, gender, profession, physical disability, mental disability, and pretty much any difference among humans you can think of. I will answer the second point first. Yes, I also doubt whether she would have been as respected had she been a black-skinned Nigerian by birth rather than a white-skinned Italian. But this is not just a weakness of Congress party workers. Indians, in general, are arguably the most racist and prejudiced people in the world, even though we like to scream "racism" at the drop of a hat when we go and live in much more liberal places like the USA. We discriminate on the basis of colour, caste, religion, language, diet, gender, profession, physical disability, mental disability, and pretty much any difference among humans you can think of. Empathy is not our strong point by a long shot - it does not even rank within the top 50 points of our character. When Shah Rukh Khan is detained at an airport because his name is Khan, we scream religious discrimination and racism at the US, but when Hindus deny housing to a Dalit or a Muslim because of their caste or religion, respectively, no one bats an eyelid. Even when we live in progressive societies like the US, our first consideration when thinking of the marriage of our children is the caste of their future life partner. This is not a Hindu problem alone - casteism is rife in Muslim and Christian society as well. Even though these people left Hinduism to convert to other religions, they have not been able to shake off caste, which has its origins in Hinduism. 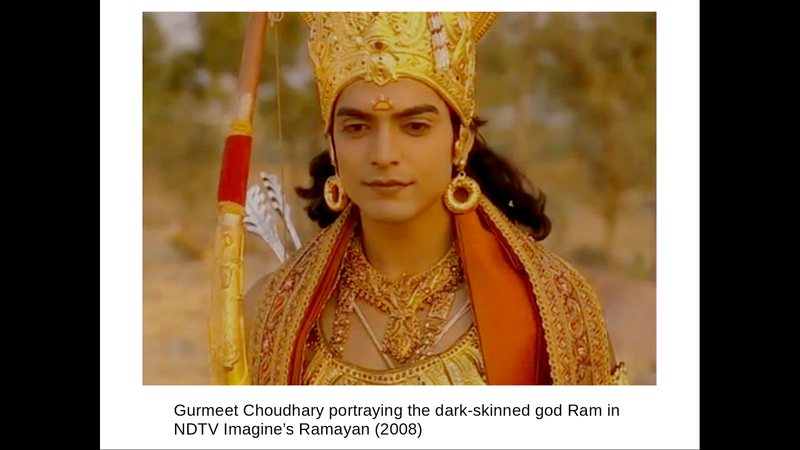 And colour prejudice affects Indians of all religions. In this respect, our reactions are not very different from the "taqiya" concept in Islam, whereby Muslims are allowed to lie about their backward beliefs when they live in countries where open espousal of their beliefs is not accepted. Similarly, many Indians living in the west pretend to be outwardly liberal, while keeping their deeply-held prejudices on the basis of race, colour, caste, religion, gender, and other differences alive and flourishing in private. Nigerians, and Africans in general, have been at the receiving end of hate attacks from Indians many times in recent years. So much so that Nigeria felt it necessary to lodge an official protest with the Indian government (and this happened only after Modi came to power.) And many of the people committing the violence are folks aligned with the ruling "nationalist" party. Colour prejudice and racism is not just a Congress problem. It is not just a Hindu problem. It is an all-India problem. We consider fair-skinned people superior and dark-skinned people inferior. Our matrimonial ads are full of attempts to project oneself as "fair" or "very fair." Often euphemisms such as "wheat-complexioned" are used to describe brown skin. We are so obsessed with fair skin that "Fair and Lovely" recently crossed Rs. 2000 crores in sales in India. And I am sure that it is not just Congress party supporters who are buying that cream. We are so obsessed with fair skin that "Fair and Lovely" recently crossed Rs. 2000 crores in sales in India. And I am sure that it is not just Congress party supporters who are buying that cream. And even though Hindu epics refer to Rama and Krishna and Draupadi (her given name was Krishnaa; Draupadi only means daughter of Drupada), and the literal translation of the word "Krishna" in Sanskrit is "dark" or "black" - we find the fairest-skinned people we can to play the roles of these characters who have been explicitly described in Hindu epics as being dark-skinned, in TV serials and movies. 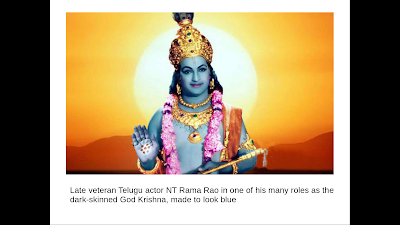 Sometimes we paint them blue in movies or in comics so that it doesn't look like black and offend our sensibilities. After all, only inferior people have dark skin, so Rama and Krishna could not have been dark, even though the epics explicitly state that - they must have been blue - even though the only blue creatures I have known of in the animal kingdom are the dogs in Vapi which got coloured blue by the effluents from dye companies there, who throw waste dyes on the street. 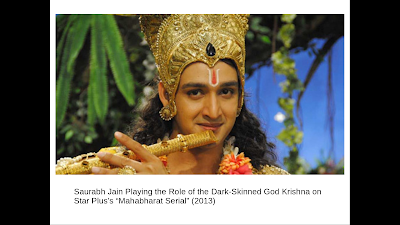 We find the fairest-skinned people we can to play the roles of these characters who have been explicitly described in Hindu epics as being dark-skinned - Rama, Krishna, and Draupadi - in TV serials and movies. Sometimes we paint them blue in movies or in comics so that it doesn't look like black and offend our sensibilities. In Tamil movies, most of the female stars are imports from north India, because they have fairer skin than Tamil heroines. The heroes are local, dark-skinned, and average-looking, however, because the movies cater to male audiences - with the fantasy that an average, dark-skinned Tamil male can win the heart of a pretty and fair-skinned woman. Most of these north Indian heroines cannot even speak Tamil, and so their voices have to be dubbed. They are in the movie only because of their fair skin. What is interesting about Sonia Gandhi's case is that she is the victim of two independent prejudices that affect her in opposite ways. One is due to her white skin and the other is due to her foreign race. The white skin helps her be seen in a positive light in a country that worships fairness, and the foreign race casts her in a negative light in a racist country like India. So she gets elevated to the post of party President because she is the widow of a Gandhi and because she is white - but she gets reviled constantly because Indians cannot accept that a foreign-born white person can ever be patriotic and truly loyal to India. Both these perceptions are shameful and bring no credit to Indians. Sonia Gandhi deserves our respect not because she is the widow of Rajiv Gandhi or because she is white - she deserves our respect because she has proved her chops in politics and managed to lead the Congress to two terms in power at a time when it appeared that they were finished. Her white skin may have been an advantage in the party's initial perception of her, but she has since earned her respect among politicians by her achievements. What is interesting about Sonia Gandhi's case is that she is the victim of two independent prejudices that affect her in opposite ways. One is due to her white skin and the other is due to her foreign race. The white skin helps her be seen in a positive light in a country that worships fairness, and the foreign race casts her in a negative light in a racist country like India. So she gets elevated to the post of party President because she is the widow of a Gandhi and because she is white - but she gets reviled constantly because Indians cannot accept that a foreign-born white person can ever be patriotic and truly loyal to India. Both these perceptions are shameful and bring no credit to Indians. And she does not deserve our distrust and condemnation because she is foreign-born. Try to have a heart and think about her. She married Rajiv Gandhi in 1968 - that is 49 years ago - and immediately left her home country, Italy, and moved to Delhi to live with him. Her husband was assassinated in 1991, but she did not run back to Italy after that. She continued to live and raise her children in India. She has lived in India for 49 years now, and been a naturalized citizen for such a long time (I don't know the date when she became a citizen, but it is not important), and people are talking trash about her and questioning her patriotism. Yep, you're right. They'd be screaming racism from the rooftops. There are those who will try to cover up their racial prejudice by claiming that they are not opposed to Sonia Gandhi because of her white skin but because of her party's alleged corruption, whether that be Bofors or the 2G scandal. But this lie is easily exposed because of two pieces of evidence. 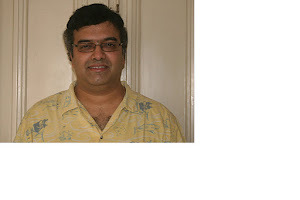 One, there are many Indian politicians who are known to be corrupt. No one other than Mrs. Gandhi gets this kind of hatred. Second, the language used by her detractors is clear evidence of their racism - they do not start by attacking her as corrupt - the word "Italian" always is among the first adjectives used to describe her. Sorry, but Indians are hypocritical and racist, and a lot more. and also utterly irrational and tribalistic. Rationality died after Sankara's supposed victories over already corrupt lamaised Buddhism. All our greatest achievements in literature, science , maths etc. happened only after the great Buddha opened the eyes of the country to rationalism. This rationality lasted for roughly 800-1000 years. What we see after Post Guptha period( 400AD-500AD) is that our scholars spent more time on interpolating, creating Puranas , divisions and justifying those divisions in the name of religion and Karma. It is complete downhill slippery slope from there.